Anchorage, Alaska suffered a magnitude 7.0 earthquake Friday morning, according to a bulletin from the National Oceanic and Atmospheric Administration, CNN reports. Four aftershock quakes have hit since the initial quake, one reregistering at 5.8 in the city of Anchorage, and more aftershocks may still come months or even years down the road, according to CNN. Alaska’s Cook Inlet and southern Kenai Peninsula are currently under a tsunami warning, and the roughly 6,000 residents have been urged to reach high ground, according to ABC7. NOAA also said that “for other US and Canadian Pacific coasts in North America, the level of tsunami danger is being evaluated.” Alaskan Governor Bill Walker has issued a declaration of disaster and is working with the White House on emergency response. ABC News reports that Anchorage police are finding major infrastructure damage across the city. Video of the event are pouring in from social media. 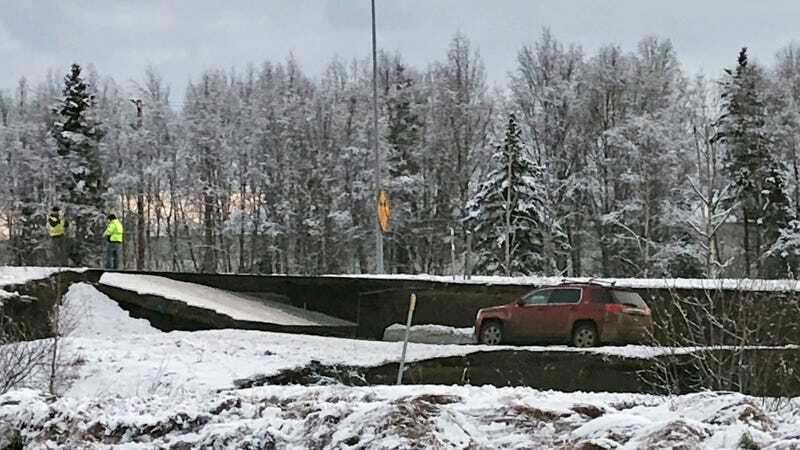 So far there are no reports of injuries, though a transportation official told KTUU that there may have been a landslide on Seward Highway. Updated: Friday, November 30 3:25 EST: Tsunami warning has been called off for the previously affected areas. This is the last update for this post.